Come join us for dinner and Mama's on 39 in Huntington Beach and also help raise money for the Beach Elite Scholarship Fund. Please take a picture of this flyer and show it to your server on your phone when you order! Wear your Beach Elite gear (uniforms, hoodies, hats, etc) and we will see you there! 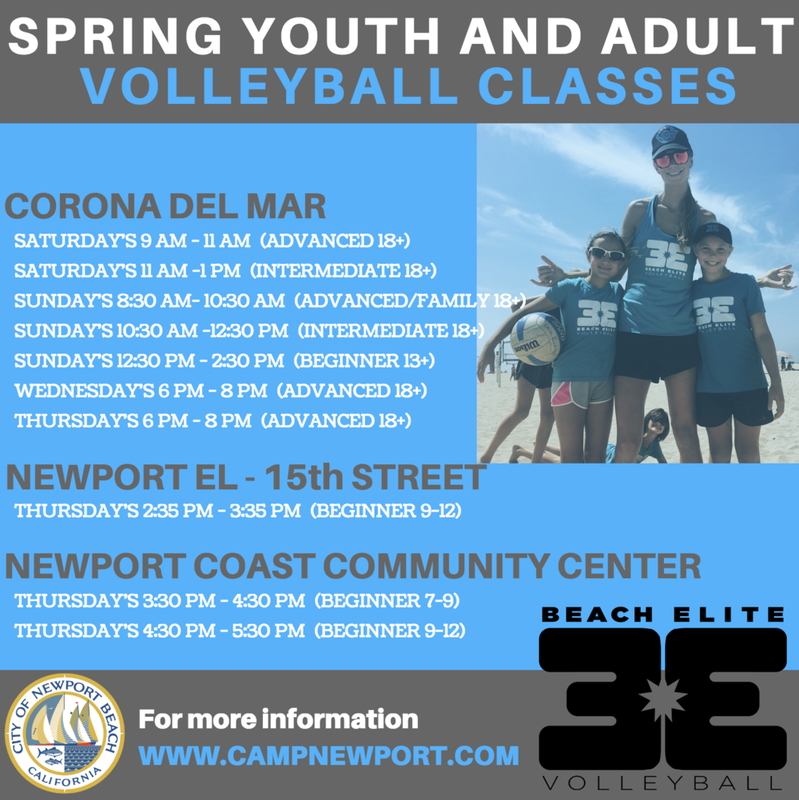 NEWPORT BEACH SPRING VOLLEYBALL CLASSES! BIG NEWS!! 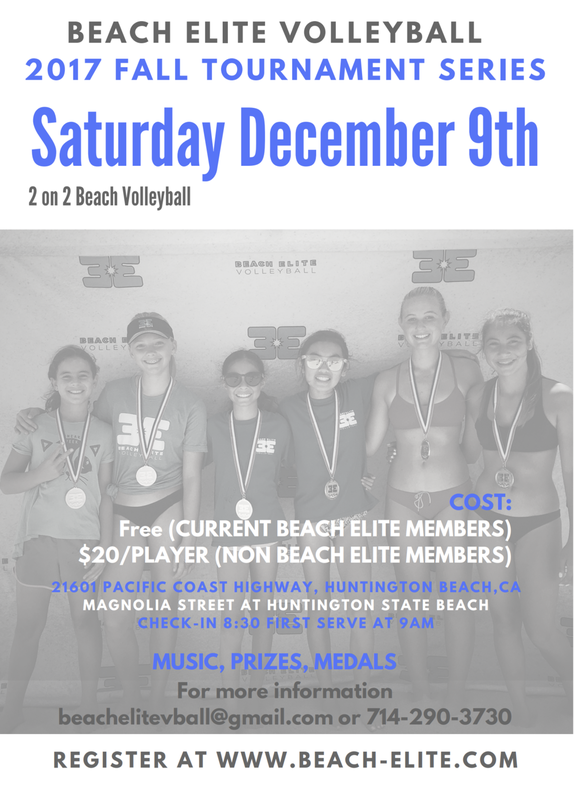 The City of Newport Beach has asked and contracted with Beach Elite to begin hosting indoor and beach volleyball classes all throughout the city! Starting in April we will provide classes in the following locations: CDM beach courts, Newport El beach courts and Newport Coast Community Center indoor courts. New Flat Bill Hats are here! WINTER BEACH SEASON REGISTRATION IS OPEN! SUMMER 2017 VIDEO NOW AVAILABLE! 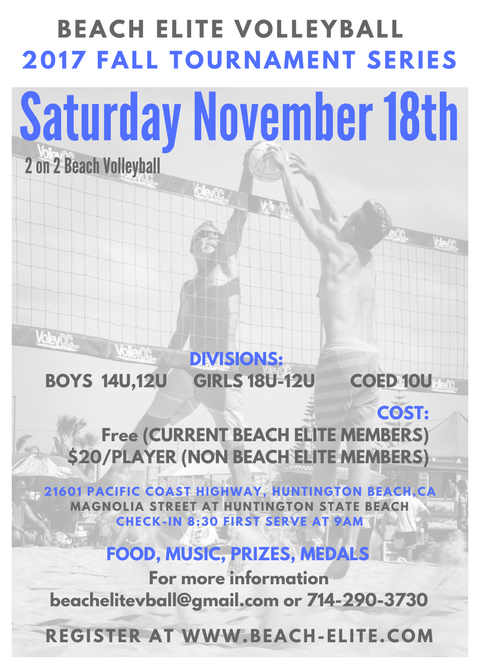 Our 2nd of 4 beach tournaments this Fall! Come join in! FALL INDOOR YOUTH CLUB TRYOUTS! Night Court is proud to present FREE TOURNAMENT WEDNESDAYS! These tournaments are held at the South Side of the Huntington Beach Pier every Wednesday night all Summer long! Sign in is 5:30pm and first serve is 6pm. Format: 2 on 2 coed or non coed. Double elimination. We had our first tournament June 28th and we had so many teams we had to turn some away so get signed up early before it fills up! It's time for our big Beach Elite Pool Party! We will have the BBQ going, the pool and hot tub open, music and fun for all our athletes! Bring your swim suits, towel, and your positive vibes and let's have a great party! Of course all parents of these athletes and the BE coaching staff are invited as well. This is a great way for all the various divisions of the club, both new and existing club members, to get to know each other and make new friends. A big thank you to the Kiralla Family for hosting this event! See you there! Get excited! Summer is upon us so register for the best youth beach volleyball camps around! Pepper Swimwear is the dream/mad obsession of Bridget Dome and Sibylle Postley. Both are avid amateur beach volleyball players, friends and mothers of young children who bonded over their mutual frustration at the lack of adequately stylish and functional bikinis for their favorite pastime - beach volleyball. So they decided to do something about it and Pepper was conceived!